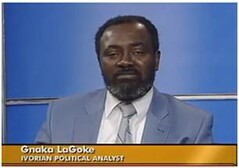 Gnaka Lagoke, Ph.D. gives his last words to the people of Africa about change in Africa. "Straight Talk Africa" on December 14, 2011 - VOA's "Straight Talk Africa" host Shaka Ssali was joined by Gnaka Lagoke, Ph.D..
VOA's "Straight Talk Africa" host Mwamoyo Hamza is joined by Gnaka LaGoke, Ivorian Political Analyst believe newly inaugurated Ivory Coast President Alassane Ouattara should release former President Laurent Gabago from custody to unify his nation. VOA's Straight Talk Africa, April 13, 2011 - host Shaka Ssali was joined by Ivorian Political Analyst Gnaka Lagoke who shares his thoughts on the role of France in the leadership stalemate in the Ivory Coast with the fall of former President Laurent Gbagbo. VOA's "Straight Talk Africa" host Mwamoyo Hamza is joined from our London studio by Anzman Diabate of Focus Africa and Gnaka Lagoke in our Washington, DC studio to discuss the steps that Alassane Ouattara should take as president to bring peace and security to his nation after of months of instability due to the leadership standoff and admit that his supporters accountable for the violence. Dr. Gnaka Lagoke founder of the Revival of Pan-Africanism Forum said today that the future of Africa is determined by the past and spoke of African issues from two dimensions.